Magnetic fasteners hold name tags and badges in place no matter how active you are. Even on thicker clothing such as suit lapels and outerwear our strong, durable fasteners hold securely. Easy to use badge magnets will not damage your clothing, you will never again have to worry about the holes and tears caused by pins and clips. Magnetic Fasteners can be added to name tags, reusable badges or badge holders. Permanent rare earth magnets are attracted to steel badge plates that are attached permanently to the back of your tags or badges. These deluxe magnetic fasteners feature a smooth strong surface, that is durable and comfortable to wear. 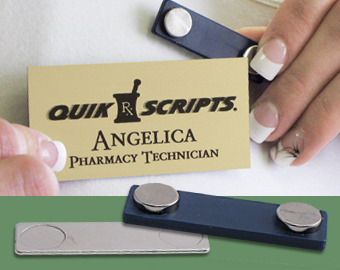 Deluxe magnetic fasteners are perfect for all of our name tag products. The metal back plate has two indentations that align with the magnets on the fastener preventing the slippage that can occur with lower quality magnetic fasteners. Two color plastic name tags with a custom design. Metal name tags. Created with a custom layout. 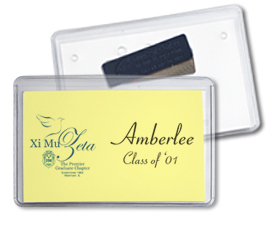 No set-up fee and choose from 11 name tag templates. 29 plastic colors. High quality, low cost metal name tags. 18 metal colors. No set-up fee. Full color logo is UV printed on engraved plastic name tags. Logo and text are engraved on plastic creating a two color name tag. Logo and text are printed onto plastic name tags using heat transferred inks. Save money and time by printing inserts for these badge using your own laser or inkjet printer. Mighty Badge and Logo Badges use our deluxe magnetic fasteners, holding the badge securely to your clothing without damage or slipping. Speedy badges are available with the magnetic fastener built into the back of the badge. High quality 3 piece reusable badge with optional logo. Easy to print clear inserts. 10 sizes/shapes available. Easy to use badges are available in two sizes and three colors. Paper inserts are easy to print with your inkjet or laser printer. 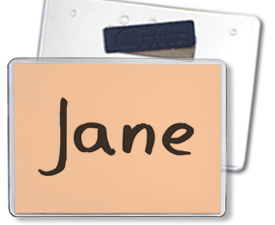 Blank name badges with a logo, room may be left for names and titles to be added using a label maker or markers. Badge holders with magnetic fasteners can be placed on your lapel, where they are easy to see and read. The smooth metal backs used with these fasteners reduce the friction when the badges are removed preventing the vinyl from tearing. Clear vinyl badge holders with plenty of room for a name and title. 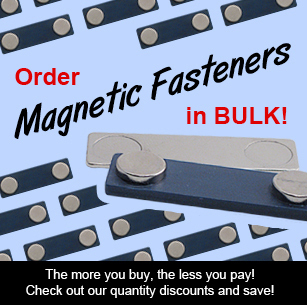 Available with magnetic fasteners and a variety of other fasteners. Clear vinyl badge holders have room for a logo in addition a name and title. Available with magnetic fasteners and a variety of other fasteners. Q: How strong are the magnets? A: They are very strong! They will hold through 5 layers of clothing. Q: Can I wear a magnetic name tag if I have a pace maker? A: No, We advise against anyone with a pace maker wearing these fasteners. Please check out some of our other fastener options! Name Tag Inc. carries a wide selection of name tags, name badges, and badge holders if you don't see what you want give us a call and we'll help you find it. Large selection – Low prices!